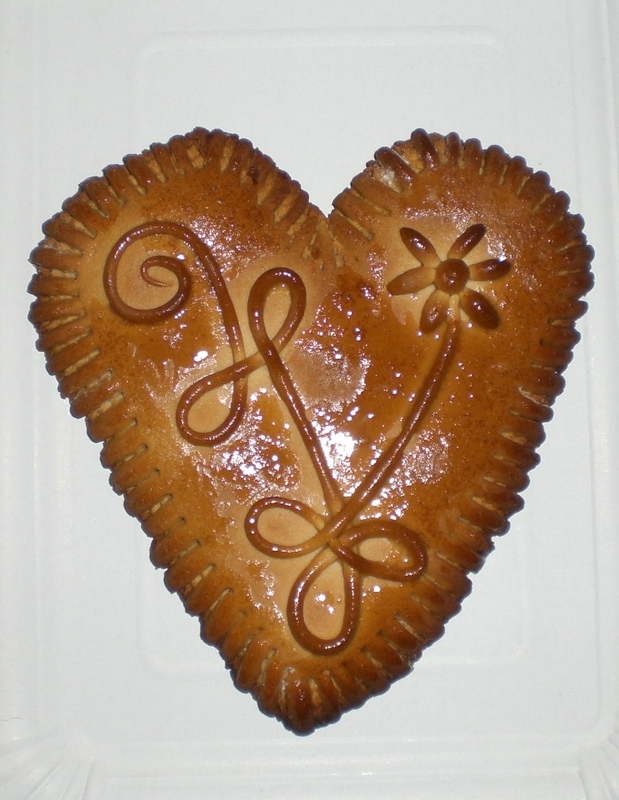 My first attempt at Dražgoški kruhki! With the weather being so awful all week (rain, rain and more rain), I don’t have any exciting trips or walks to report. However, I found an indoor activity to do instead and went on a course at the Biotechnical Centre in Naklo to learn how to make Dražgoški kruhki; handmade, ornamental honey breads, a speciality of the village of Dražgoše. 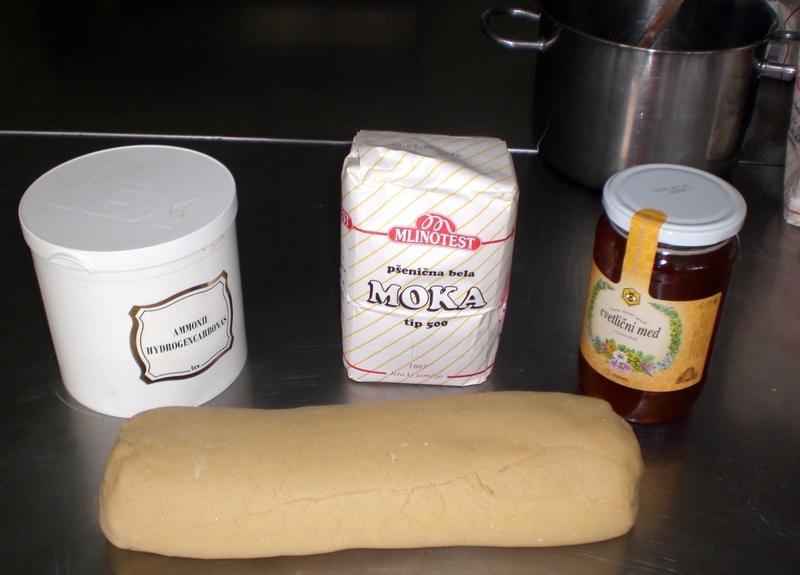 The recipe is really simple as there are only three ingredients (as seen in the photo below together with the prepared dough); flour, honey and ammonia carbonate (jelenova sol), available from the chemists, but which could also be substituted for bicarbonate of soda. After mixing and kneading the dough, then comes the decorating, for which a bit of patience and flair is required (that latter not being something I have in abundance!). And this was my finished product – not bad for a first attempt don’t you think?! 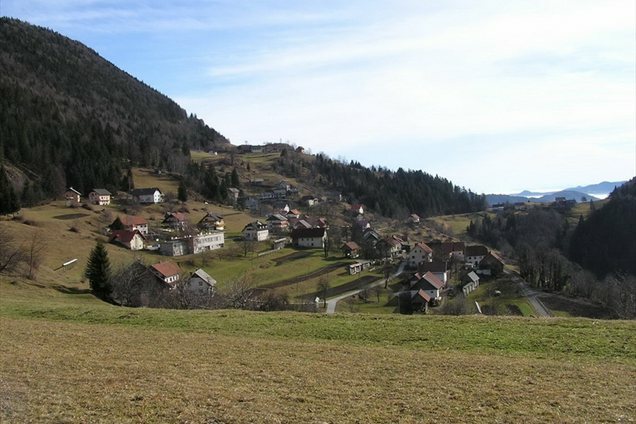 The small village of Dražgoše (pictured below), after which these honey breads are named, lies on the south slopes of Jelovica, the plateau which dominates the view to the south of Radovljica. As well as being known for its honey breads, Dražgoše is also known for being the site of a second world war battle between Slovene partisans and Nazi German armed-forces. After suffering heavy losses the Nazi forces set fire to the village, shot 41 hostages and deported the remaining residents. In 1976 the Dražgoše war memorial was built just outside the village to commemorate this battle and the destruction of the village. There is now a traditional commemorative night walk from Pasja ravan to Dražgoše (Po poti Cankarjevega bataljona), which is not for the faint hearted since it takes place annually in January and takes on average around 10 – 12 hours to complete. At the beginning of this year, (2nd January 2013), I wrote about how I had met and enjoyed the company of two of Slovenia’s national treasures – Ivanka Kraševec and Ivan (Žan) Prešern. As well as both having very successful music careers, Ivanka and Žan also devote their attention to painting these days and have both hosted exhibitions. I was therefore surprised and more than delighted when they gave me a painting last week, a belated birthday present, which Žan had painted especially for me, and similar to one his paintings that I had been previously been admiring. The painting is of the beautiful view looking out over the back of Radovljica, across the valley and towards Triglav. To see this view at its best, there is a new viewing platform which can be reached by walking through the old town in Radovljica and turning right shortly before the church. There is an information board which details all the sights and a couple of benches, perfect for simply sitting and soaking up the views.